Our trip to San Francisco included visits to a number of bakeries and pastry shops. This time, we stopped by a new place, the interestingly named Craftsman and Wolves. 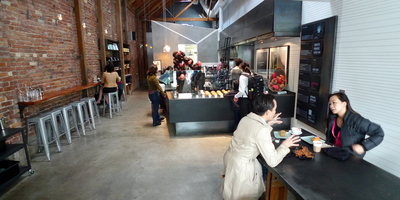 Located on Valencia Street, they describe themselves as a “contemporary patisserie”. Compared to the homier looks of Tartine and Thorough Bread, Craftsman and Wolves is distinctly modern. The interior feels very large and a little cold. Nonetheless, the staff is welcoming and a large communal table at the front, next to a picture window, makes for a comfortable place to run into people unexpectedly over a cup of coffee and a pastry. The selection of baked goods (this picture is just a sample) is wide, ranging from your standards (croissant) to something called The Rebel Within, which is akin to a baked Scotch egg. Again, comparing to some of the other bakeries that we visited in San Francisco, the display of goods here looks less bountiful and more austere. 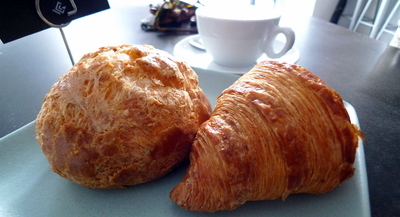 We shared a gougere (baked cheese puff) and a croissant, both of which were well made and delicious. The croissant isn’t cooked to as deep a brown as at Tartine, but some consider that very caramelized exterior to be an acquired taste. Curious, I also ordered one of their muffins. I don’t recall what variety it was but remember that I enjoyed it, although wasn’t particularly overwhelmed. It was a good muffin, but not earth-shattering in its goodness. For something more substantial, we ordred the frittata. 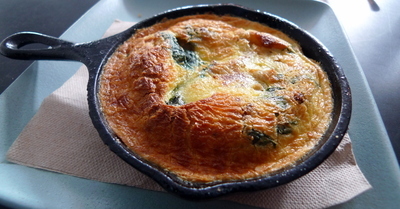 Filled with vegetables, this frittata was remarkably underseasoned. We had to ask for some salt and having no salt shakers handy, they filled a small pinch bowl with some salt for us. Overall, Craftsman and Wolves is another nice place to add on the list of bakeries and pastry shops to visit in SF. I think the minimalist interior, which would work well for a chocolate shop or somewhere selling fancy cakes, isn’t as welcoming as I would enjoy. That said, the food is good and that’s ultimately what matters. This entry was posted in Uncategorized and tagged bakery, craftsman, food, pastry, patisserie, Restaurant, sanfrancisco, sf, shop, valencia, wolves by christao408. Bookmark the permalink. That gougere looks yummy. I made some once that were pretty successful, but did’t look quite that nice. I would like to sample the fare at every pastry shop whose path I cross. I can eat and learn! It looks tasty. Like the restraunt too. Very welcoming atmosphere. I am surprised that the food is not in the excellent catagory. I’d probably like the frittata. Not used to much salt in my diet. I wonder if you consider yourself getting overweight? Maybe you are exercising or starving between meals?Amazing what words can convey. I am thinking that brickwork can make you feel cold. @whyzat – I’ve always suspected that the reason that baked goods look so much nicer at places like this is because their ovens are much hotter than home ovens. @PPhilip – According to my doctor, I should lose about another 30 pounds to be in the ideal weight. I exercise daily and generally watch my eating habits, so am trying to make progress in that direction. @Fatcat723 – Spoiled for choice, so I can be picky! @Inciteful – @Inciteful – Good choice! @armnatmom – The people definitely made it welcoming. the selection looks good enough for a morning or afternoon coffee break. Even in the photo this spot looks a bit stiff and uncomfortable. Looks like a nice variety of pastry and sounds like a nice spot by the large window to sit and sip coffee and have a pastry. @Grannys_Place – Yes, “stiff and uncomfortable” captures it nicely.